With the exception of mothers and their young, raccoons live solitary existences. The mostly nocturnal raccoon is an opportunistic omnivore native to North America. Young raccoons typically stay with their mothers for about a year after their birth to learn how to find food. During this time, mothers are extremely protective and will attack anything that comes too close to their young. The months of January, February and March are mating season for raccoons. Most mating occurs during March, although raccoons living in the more northerly portions of the animal’s geographic range tend to breed earlier than those to the south. During the mating season, males expand their usual geographic range, presumably to increase the possibility of encounters with females. Although females and males may den with each other temporarily during this time, they do not associate with each other after mating; females raise the young on their own. Female raccoons are pregnant for around two months before giving birth to a litter of between four and six young. Raccoons are born blind and completely helpless. Their eyes do not open until they are approximately 3 weeks old. They will be between 4 weeks and 6 weeks old before they are able to stand on their own. The mother weans her young when they are between 2 months and 3 months old, and they will leave the nest with her and start to hunt for food with their mother’s guidance and assistance. During these first forays out of the den, the mother may carry the babies individually in her mouth. As the young raccoon continues to grow, his mother will teach him how to hunt on his own and how to climb trees to escape predators. 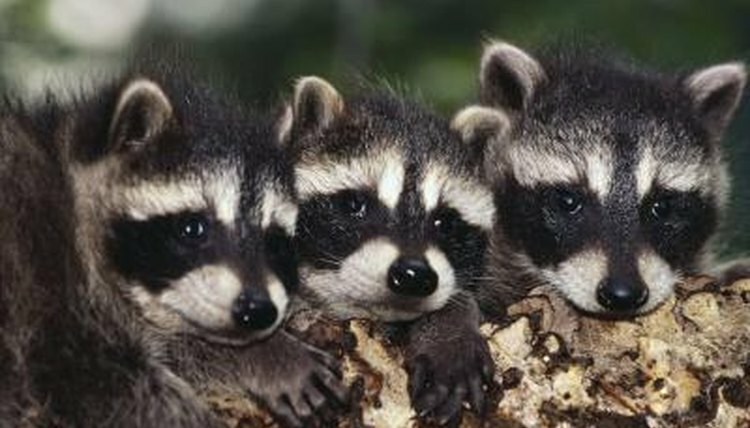 By the time raccoons are around 5 months of age, they regularly forage on their own as well as with their mothers, but they continue to den with their mother and their siblings. This family unit remains intact throughout the adolescent raccoon’s first winter. Although raccoons do not hibernate, families stay together in the same dens, sleeping through the most severe winter periods. In early spring following the year they were born, young raccoons typically leave their mother’s den. The average adolescent raccoon becomes independent at 10 months of age, some leave home as early as 8 months and some as late as 12. Females are sexually mature at this point, although males do not reach sexual maturity until their second year. Even after they’ve reached maturity, young raccoons may choose to den near their mother or somewhere on their natal home range. Young male raccoons are more independent, however, and may move several miles away from their mother before establishing their own dens and home ranges.